Since Sally and I left our beautiful mooring on the northern fringe of Locks marina at Calcutt Boats just over a month ago, I’ve received a steady stream of emails from site subscribers asking whether our cruise to date has been as enjoyable and relaxing as we hoped when we began planning our semi-retirement cruise nearly a year ago. Let me describe two days at the beginning of this week and show you just two photo’s. You can draw your own conclusions. We were moored close to Hopwas village opposite Hopwas Hayes wood. Wood bridge, one of two foot bridges over the canal into the woods, was a hundred metres behind us. On the towpath side of the boat, a wooded hillside fell a hundred gentle feet down to the equally gentle and appropriately named river Tame. Free to do as we please all day, every day. What’s not to like about our new lifestyle? 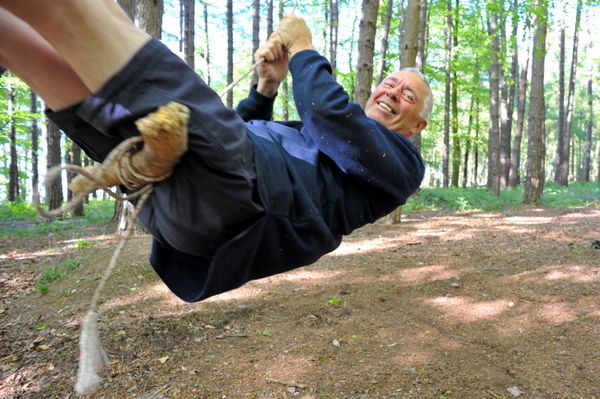 Hopwas wood is a dog walker’s and nature lover’s paradise. A network of well used, mainly dry footpaths snake through four hundred acres of ancient woodland, up and down steep hills, around a small long disused canal-side quarry and around the perimeter of the woods with sweeping views over miles of Staffordshire countryside. There’s stands of towering beech, a jungle of dark and impenetrable spindly birch, towering pine and magnificent twisted oak shading carpets of bracken. The woods is a wonderful place to take two energetic dogs to let off steam while we sit on a fallen trunk enjoying a tasty packed lunch. Even though my life has been far from stressful in recent years, spending time in this environment is as close as I’ve ever been to complete relaxation and peace. Both Sally and I have thoroughly enjoyed spending time in these woods but, with appointments to keep, we moved on again on Wednesday. If I’m on my own at the helm, which I am most of the time, my favourite steering positon is sitting on the starboard side of the cabin roof with my heels braced against the left hand side of the cabin hatch frame, my right foot ready to dip beneath the hatch to gently tweak the Morse control. I invested in a Midland Chandlers waterproof knee kneeler to cushion my bony behind. Seventeen pounds fifty very well spent. I can sit there for hours now in complete comfort. After leaving Hopwas we stopped close to Asda on the outskirts of Tamworth for shopping, then Fazeley Junction for water, rubbish disposal and to empty the cassette, then re-joined the Coventry canal and passed the first graffiti since Birmingham three weeks earlier. It’s interesting watching the interaction between footpath users and passing boaters. Dog walkers, often helmeted leisure cyclists, joggers and anglers usually turn their heads, smile or wave or both. Those simply using the towpath as a shortcut between two points in their busy lives walk or ride with heads down, uninterested either in the people or the scenery around them. Quite a few of these insular towpath users passed me as we moved through Tamworth. Onwards and upwards we cruised through the slow filling pair of Glascote locks, past an empty basin now devoid of boats, once home to Steve Hudson and his band of evangelic boat owners, now occupied by just two primer painted shells. A spindly grey heron floated into the air from a canal-side garden suspiciously close to a carp filled pond. Minutes later, there was sudden tap on my leg and an olive wood board appeared through the hatch, plate for my working lunch of chilli cheese and garlic chutney of Jacob’s cream crackers. The hand disappeared, then appeared once more holding a steaming mug of coffee. 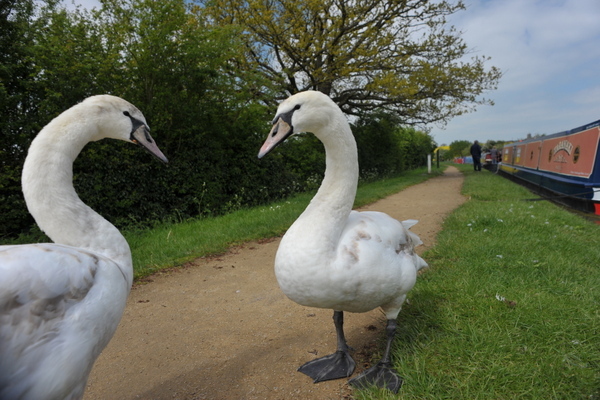 I passed two attentive swans with seven cygnets, rows of empty pontoons at Alvecote marina, then Pooley nature reserve dissected by the busy M42 overhead. Two hours into the journey we caught up with CRT’s towpath maintenance contractors close to Polesworth. We had been following them since they passed us at Hopwas the previous afternoon, ploughing through a thin waterborne carpet of cut grass. We moved slowly past a continuous line of live aboard boats between bridge 49 and the start of the Atherstone flight. We reached the head of the flight at 5pm, helped by a Birmingham couple on NB Romany Girl. They were behind us on the flight but each time we reached a lock, the lady hurried along the towpath from the previous lock to close the upstream gate for us as we left. How kind. As we left Atherstone I frightened the life out of Sally. I rounded a very shallow bend, moving closer to the offside to avoid some long term moorers, and pushed the starboard side of the boat on to a steeply shelving mud flat causing us to list by twenty degrees for a minute before I slip back into deeper water again. Sally popped her head through the rear hatch looking like she was about to abandon ship. She thought we were sinking. Over the next half hour I tried to moor five times on a suspiciously empty west facing sun soaked and wind protected stretch of towpath. Frustratingly I couldn’t get the stern closer than six feet to the bank so we finally stopped after the next bend, in the shade but close to the bank. A grey and cold start at 7.30am for another full day’s cruise. Past CRT’s Heartshill depot, then a six feet high concrete bank on the offside in front of long neglected quarries, followed by more former quarries, the spoil heaps now pleasingly grassed, on past CRT’s Mount Jud long term moorings, empty apart from three dilapidated cruisers and then half an hour of urban cruising through less than expected floating plastic and under occasional graffiti covered bridges. 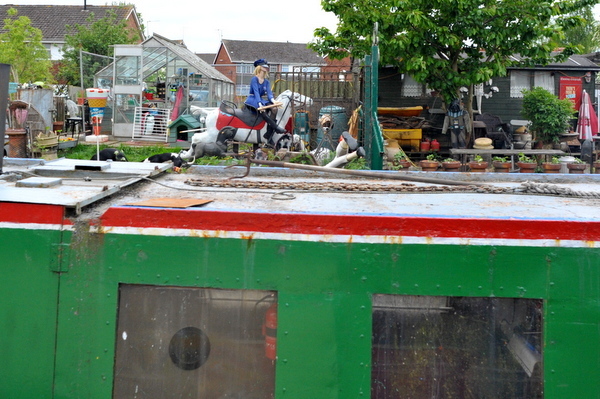 We saw, or rather, felt, the day’s first moving boat on the outskirts of Nuneaton. We rounded a tight bend straight into the bow of Royal Navy owned Calcutt Boats maintained narrowboat Trafalgar. Some swift evasive manoeuvring from both boats, a brief encounter with the Armco for them, and a little unexpected offside undergrowth clearing from me, then we were both on our way. Just past Marston Junction and the start of the Ashby canal we crawled slowly past Charity Dock with its collection of old and unloved GRP cruisers and nearby silently staring manikins. We moored above the stop lock at Hawkesbury Junction for lunch at The Greyhound. An hour and a half later we set off in heavy rain. I didn’t mind. I look forward to heavy rain. The £250 I invested in a set of Guy Cotton deep sea fishermen’s yellow plastic waterproofs was money very well spent indeed. They don’t look trendy and they immediately soak you from the inside if you do any physical exercise such as opening and closing lock gates. 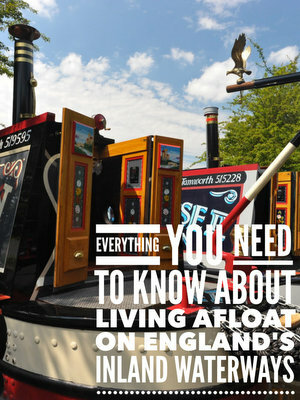 But for standing motionless for hours on end at the back of a narrowboat, they are perfect. I stood exposed to the elements for four hours in torrential rain as we trundled alongside the M6, ducked under the M69, swung around Ansty then cruised above its picturesque golf course on the right and the West Coast Main Line a handful of feet away on the left. We paused briefly to negotiate Rose Narrowboat’s swing bridge then veered away from the railway to the comparative peace near Brinklow marina where I hoped to moor for the night. My mind was playing games with me again. I was sure we moored close to the marina a couple of years ago when we passed this way but all the banks were shallow and inaccessible. After hoping for a quiet and peaceful mooring, we ended up sandwiched between a rail and a road bridge close to Lime Farm marina, but it was either there or hoping to find a free spot on the always popular Newbold visitor moorings. We moved from our rather soggy spot on Friday morning, passing a solid rank of boats on the Newbold moorings, then on to much drier but very shallow moorings close to Tesco in Rugby. The moorings are handy for shopping but a pain to use especially if, like me, you leap gazelle like four feet from the boat straight into a pile of muck left by either a small horse or a very large dog. Securing the boat took me five minutes. Cleaning the foul smelling dog dirt off my new trainers took quarter of an hour. Nipping to Tesco to pick up everything we need didn’t take much longer. While Sally unpacked our groceries, I cruised gently away from noisy central Rugby to a far more peaceful setting at the tandem flight of three locks at Hillmorton. While we stopped at the water point below the flight, I made friends with three very gentle adolescent swans dozing on the grass close to our stern. All three crowded around me gently nipping my tee shirt with shoulder high beaks, trying to reach four slices of wholegrain bread I held out for them. Above the bottom lock we pulled over again so that I could lug our full cassette over the road bridge to the Elsan point on the opposite bank. I didn’t mind. Cassette carrying should be a thing of the past in less than a week. See the composting section below to find out what I’m talking about. Once through the locks and after an hour’s stop at Hillmorton Wharf to talk toilets (see below) we trundled along the canal for another half hour before mooring on a short length of Armco on an otherwise shallow bank ensuring that we had no guests for the rest of the evening. Or so we thought. At 8pm we heard the sound of ever louder singing and shouting, then a racing engine, then an almighty bang as a Union Canal Carriers hire boat smashed into our bow, then scraped the full length of our port side. The four beer swilling thirty somethings on the front deck smiled and raised half apologetic hands. The three morons on the rear deck simply laughed then jammed the throttle forward, thankfully speeding them and their idiocy far, far away from us. Since we joined the Oxford canal at Hawkesbury junction there had been a significant increase in the number of boats on the move, both privately owned and hire boats. Fortunately most of the helmsmen knew what they were doing and treated their own boats and those around them with respect. Another hour at the tiller the following morning brought us to a familiar and thankfully deserted stretch of Armco opposite sheep filled fields a mile from Braunston Junction. After wandering into Braunston to visit Midland Chandlers to buy a tin of Toplac Mauritius Blue to replace the concrete hard tin in the engine room, we sat in our camp chairs in the warm sun trying not to notice the icy wind. Our solitude came to an end when a hire boat slowly cruised past the 300m stretch of boat free Armco either side of us then, with a great deal of determined effort, managed to reverse their boat on to their night-time mooring two feet from our bow. We’re still there now. The hire boat has gone. Sally’s unloaded everything off the front deck, then removed the cratch cover. Now she’s rubbing down the cratch board woodwork ready for touching up. I suppose I’ll have to go and do my bit in a minute. Sally and I have been living off grid for a month now. It’s not long in the grand scheme of things but four weeks is long enough to discover that we can manage our lives on board much more efficiently and cheaply than we used to. Take our water supply for example. We have a very modestly sized tank. At three hundred and fifty litres it is less than half the size of most narrowboats, so initially the limited supply caused us some issues. Sally didn’t realise quite how small the tank was until we ran out a few times miles from the nearest water point, especially after her eyes glazed over and she began one of her marathon washing sessions. Our twin tub washing machine’s wash tub hold forty litres, so if Sally washes a load, then empties and refills the tub a couple of times to rinse the clothes through, she’s used a third of our water tank. Three loads of washing in a day and, hey presto, we’re out of water. Sally also used to enthusiastically turn the taps on full to rinse a couple of plates, wash the dog’s bowls, fill a bucket to clean the floor, or any one of the dozens of tasks on board requiring water. I was almost as bad. The problem was that both of us were used to having an unlimited amount of water almost on tap. On our old mooring at Calcutt Boats, the pontoon mounted water supply was just ten feet from our bow. We often left the hose connected to the tap with the nozzle jammed into our tank filler. Whenever we needed water, which was often, we simply walked to the front of the boat to twist the hose nozzle. Once we moved to our new mooring at the marina at the beginning of April, refilling our tank wasn’t quite so easy. The nearest tap was 100m away so we had to buy two new Hozelock reels each with fifty metres of hose then wheel into position and reel out both of them whenever we wanted to refill the tank. We soon developed a routine though so we reverted to our wasteful ways. Over the last month, we’ve slowly reduced the water we use and refined the way we use it. Forward planning is the key to a happy life on board. Now, Sally does the washing while we are cruising, as long as we are cruising past a water point. She tries to get as much done before we reach the water point so that when we top the tank up we can use it for showering and washing dishes only and so stay longer in rural moorings. Providing there isn’t a queue at the water point, we also both try to have a shower while we are filling, especially if Sally needs to wash her several feet of hair. With the washing done by the time we reach the water point, while the tank is filling Sally fills the twin tub with water too so we have an additional forty litres of clean water which she has available to use for floor or dog washing without having to deplete the tank. To save more water, and because of the more efficient way we’re managing the contents of our diesel tank, I only shower every other day. Sally showers every day but because we don’t have hot water every second day, her showers tend to be both brief and very vocal. We don’t have hot water every day because to heat water when we’re off grid I need to run the engine for an hour. I don’t want to run the engine and use one and a half litres of diesel if I don’t need to charge my battery bank. I’m delighted to say that I don’t need to top the batteries up daily because (A) my new bank of four 160ah AGM batteries is performing much better than my old bank of four 135ah lead acid batteries and (B) we don’t waste our electricity so much these days. We bought a 2.6kw Kippor suitcase generator to allow us to use high power mains appliances when off grid. These appliances included a vacuum cleaner, iron, hair dryer and straighteners and my Nespresso coffee machine. I had very little interest in the vacuum cleaner and none at all in the other appliances apart from the coffee machine but Sally seemed to think they were important. I was both delighted and surprised to discover that the coffee machine would just about run via the inverter and battery bank. In the last month the hair dryer, hair straighteners or iron haven’t been used at all. The vacuum cleaner has been used twice for a total of ten minutes; once when Sally cleaned our mattress properly and once when I have the engine room a spring clean. We could have managed without the vacuum cleaner on both occasions. Coincidentally, I received the following email on the subject of vacuum cleaners from narrowboat enthusiast Richard Genner while I was writing this section. “picking up on the references on your website about 240V appliances on narrowboats, and knowing that cleanliness is next to Godliness, and that many narrowboat users will like to swing their feet out of bed onto carpet in the morning, and maybe in the summer months toddle along bare-footed on carpet to the kitchen, kettle and first coffee of the day, a vacuum cleaner is something of an essential on a boat, but they are quite 240V power hungry appliances. But how many narrowboaters have twigged to the potential of the new generation of battery powered vacuum cleaners? My wife bought one before Christmas 2014, and I am impressed, it’s light, powerful, effective and easy to empty, and of course doesn’t have the dreaded power lead. And it’s quite slim-line, so on a narrow boat, it could easily be put away/hidden away at the back of a wardrobe, and therefore, of course, not sit there glowering ‘use me’ every time you pass it! There is a down side, of course, it wasn’t particularly cheap. But my wife firmly believes you get what you pay for, ours is a Bosch and is effective and well made, and courtesy of the internet, we paid the lowest available price, but everyone can make their own choice. The beauty is that is powered by a rechargeable battery, so for boaters, use it when moored at the canal/riverside, waiting to get into a lock, etc. and charge it from the alternator on the engine when travelling, or from the shore-line when moored against the pontoon in a marina. I can’t find a power-rating for the charger but it is no bigger than my laptop charger, and it takes 3 – 6 hours to charge from flat to full the 25.2V lithium battery, so the draw on a 240V must, I believe, be well with in VA rating of any inverter worth having on a boat. I have to disagree with Richard with regards to carpets. Dogs, boats and carpets are not a happy combination. We replaced the boat’s threadbare carpet with oak effect laminate flooring. It’s much more practical because it’s so much easier to keep clean. I toyed with the idea of using a cordless vacuum cleaner before I invested in the generator. In fact, I actually bought one. It’s was a well thought of, rather expensive Phillips hand held vacuum. It didn’t hold a great deal but I thought it would be ideal for whizzing around the boat picking up dust and dog hairs on a daily basis. I bought it while Sally was away in the Philippines. When she returned, after I had been enthusiastically using it for three or four weeks, I proudly handed it to her and told her how much easier her life would be with this handy little appliance. She did a very good Elvis impression as she curled her top lip then grabbed the vacuum off me and waved it at the floor for a few seconds before handing it back and walking off. She’s not touched it since. I considered investing most of my savings in a Dyson Animal cordless vacuum cleaner. Dyson claim that it’s as powerful as a mains powered vacuum. I know a couple of boaters who use them and agree that they’re more than powerful enough to do the job. I don’t think we’ll be going down that route though. Now Sally is used to not having an immediately accessible vacuum cleaner, she’s more than happy to do without. She simply uses a dustpan and brush to sweep up the loose dirt and dog hairs before cleaning the floor with a mop. Ironing has been dispensed with completely. That’s not because we (Sally) have let our standards slip. We both still look as neat and tidy as we’ve ever done, but without the aid of a power hungry device. Sally’s solution is simple. Once she’s taken a load out of the twin tub spin tub, she hangs the washing on a rail above the washing machine until it’s dry and most of the creases have fallen out, then folds everything neatly and stacks it on three shelves I had fitted last year when our terminally ill gas heater was removed from the bathroom. Sally, who is ever critical about our appearance, can’t tell the difference between clothes she has painstakingly ironed and garments which have been hung, dried, folded and stacked. Hair drying has become a thing of the past too. Not that my own half inch long hair has ever been a problem but Sally has much more of a logistical issue with nearly two feet of the stuff. Since we’ve been off grid full time, Sally is far more relaxed. She isn’t in a hurry to go anywhere so she’s more than happy to allow her hair to dry naturally. It’s a change which I’m sure is better for her hair. It’s certainly better for our battery bank. Because we’ve been moving most days, I haven’t had to be too careful with the battery bank’s charge but on two occasions we’ve stopped for three or four days in one spot with little or no engine running. During those periods, I made sure that the inverter was only running long enough to power our devices before switching it off thereby minimising the inverter’s drain on the bank. Most frugal live aboard boat owners would still find us wasteful but we’re happy with the savings we’ve achieved. Our intention is to use our resources carefully but not to live without life’s creature comforts. I think I’m turning green. Maybe you will too after reading this, so skip this article if you’re about to have lunch or are of a delicate disposition. After a month living off grid, Sally and I are seriously considering swapping our Porta Potti Elegance cassette in favour of a composting toilet. I’ve spent the last week researching the subject. In the process, I’ve learned far more than I really wanted to know about other people’s bodily waste. I know one or two boaters who use composting toilets but they are very much in the minority. I’ve been put off using them in the past after hearing too many tales of compost toilet users having to take mechanisms apart so that they can dive into their festering solids to try to get the thing working properly. Many of the conventional composting toilets struggle to compost waste effectively. The problem is that both liquids and solids are deposited in one tank which means that the composting process, which requires the waste to be dried, involves additional heat and ventilation if it is to work properly or even at all. The most effective composting toilets separate liquids from solids allowing the liquid reservoir to be removed and emptied every two to three days. The solids are stored in another part of the toilet where the composting process takes place. 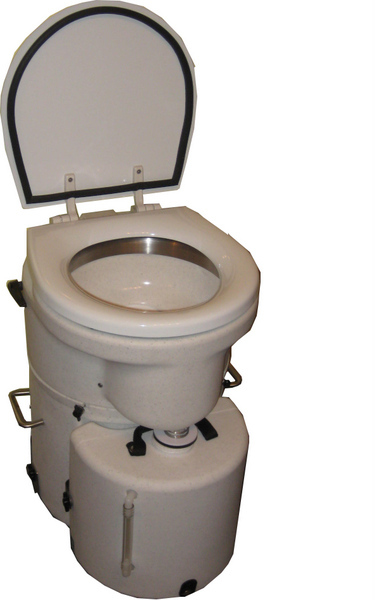 The smallest and one of the most effective composting toilets available is the Airhead Compact. It’s slightly smaller than the Porta Potti Elegance we have at the moment. I’ve researched effectiveness of composting toilets in general and the Airhead model in particular. I looked for reviews online, both good and bad. I’ve found a number of positive Airhead reviews but nothing bad at all. At £800 + fitting, the toilet is a sizeable investment, but Sally and I think it will pay for itself quite quickly. Our problem is that we tend to use our current Porta Potti just for liquids because we’ve always found the toilet both ineffective and smelly if we use it for the more serious business. Because we only use the on board toilet for liquids, we have to use public conveniences for everything else. The public conveniences available to us on the canal are usually pubs or canal-side cafes. We don’t like to take liberties so we usually buy at least a drink and maybe a cake or two in the cafes. Sometimes we go a little over the top and have drinks and a meal. Over the last four weeks, we’ve spent over £100 in pubs and cafes, all because we want to use their toilets. If we waste a similar amount over the rest of the year, the cost of an effective odour free loo on board to use instead would soon pay for itself. Earlier in the week I swapped a few emails with Richard, owner of The Canal Shop at Hillmorton Wharf. On Friday we moored there then spent an hour talking to his wife Susanne. Susanne and her husband Richard live on their boat moored close to the shop. They’ve been using a composting toilet on board for the last two years. Susanne told us that not having to flush the toilet after she’d finished was the hardest part of switching to a composting model. Apart from that, the transition was surprisingly easy. The most important aspect of composting loos to remember is that the composting process will only work if there’s a healthy colony of aerobic bacteria in your toilet. The bacteria is within all of us. When you pass solids into the loo, you pass healthy bacteria too. The bacteria is aerobic which means that it needs oxygen to survive. If there’s too little oxygen, too much moisture or any chemicals present, the bacteria dies, the composting process stops and you have a smelly toilet. Removing excess moisture is achieved initially by separating solids and liquids. Once the solids are deposited in their own holding tank they are kept dry by drawing excess moisture away with a small 12v fan and aerated with a little human help. There’s a crank handle on the side of the toilet which you turn a couple of times every time you use the loo. The handle turns paddles inside the solids container which stirs the solids and toilet paper within. It’s essential to keep liquids and solids apart so a flap is kept closed unless you want to make a deposit so that all liquids are directed into the urine tank. To minimise the chance of liquids entering the solids receptacle, male users are required to sit to wee. Cleaning and maintenance Is minimal but any cleaning must be done using eco products. Chemical use of any kind is disastrous. The urine container is kept odour free by adding a spoonful or two of sugar when required. Cleaning is done with a mixture of water, vinegar and tea tree oil. Emptying the loo is simple. The liquid reservoir is easily accessible at the front of the toilet. You unclip it, take it outside and empty it into the nearest hedgerow. This method of disposal is EA approved. The solids container is a little more difficult to get to, but no harder than getting at the cassette on our Porta Potti Elegance. The whole unit weighs just 15kg so lifting the toilet off the solids container on the base isn’t an issue. Once released, the solids container can be emptied into a bag for disposal at one of CRT’s general waste facilities or, if there are no bins nearby, with the landowner’s permission, in a hole in the ground. Again, this method of disposal is EA approved. The Airhead is solidly built with few moving parts to maintain or to go wrong. It’s been tested in the most difficult marine environments over the last fifteen years and, last but not least, it will fit into the smallest narrowboat spaces, including our tiny walk through bathroom. After a quick chat with Sally, I ordered one while we were with Susanne. We’ve scheduled the half day installation for Thursday next week, so we’ll be able to try the new toilet out while we’re eating and drinking to excess for three days at the Crick Boat Show. In the meantime, I’ve ordered a compact folding spade from eBay and a bottle of tea tree oil from Amazon. We’re ready to go green. “At present my plans are not properly established. I will buy a narrow boat sometime later this year and would like it to be a ‘live aboard’…… but I do not think I will be happy as a continuous cruiser. That presents the problem of moorings which we know are difficult to find especially if you want to be in a particular area. Perhaps I might get an ordinary mooring and just spend a great deal of time on the boat …… although that isn’t overly attractive. 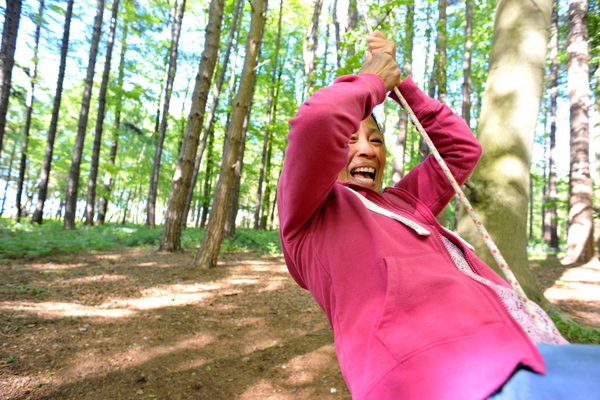 As for booking a Discovery Day the reason(s) were simple …. I needed to get the feel of the water again and I needed to see how the other half lives. The hope was to gain an insight into not only of the pleasures of, but more importantly the problems of, living day to day on the water. It doesn’t matter how much you read on the subject or listen to the view of others you need you be there. Well the day generally was everything I had hoped for, except perhaps for the weather …… it was much too kind. Information ? plenty of it …. all questions asked were answered as were many that I didn’t ask. Tips on boat purchase, etiquette, steering, maintenance, day to day problems and chores, IT, home management e.g. storage, fuel and power, and so on, were all extremely helpful (even if I didn’t write them all down).